Everyone should be doing it. The benefits are numerous. Journaling is an essential tool for a healthy mind. Dear Diary. Ha! There’s no need to ever use those words. Unless you really want to. They have been a trusted prompt for many a teenage girl, and likely more than a few teenage boys. But you can start however you want. Journaling is an important mental health coping tool. Everyone should keep a journal. Everyone. Regardless of your mental health status. There are some words you should never say to your boss. You know what I mean. Depending on your boss, you probably have many choice words you would like to say. But some words should never be spoken. Never. Even if they are true. No doubt your head is full of things that you should not say to your wife, your partner, your children, your friends, your co-workers, etc. 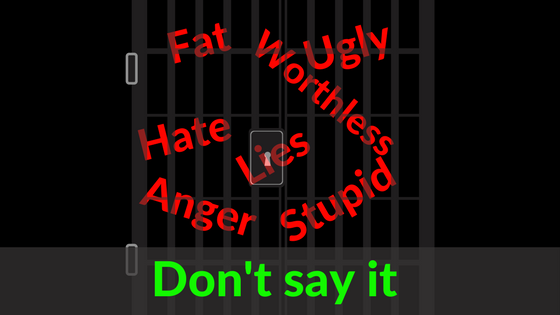 If you deal with mental illness, those words might be on an endless loop in your mind. You wake up thinking them. They are the theme song to your day. Then you go to bed thinking them to awaken the next day and start all over. They don’t have to be there. If you keep trying to stifle them, at some point they will find a way to escape your lips. Then you risk getting fired, punched in the face or much worse. There’s a great post on why you should choose your words carefully. Click here to read it. This is where journaling comes in. Putting those words down, whether physically on paper or digitally in a Word document, is your answer for relief. Most often those words just need to be said. 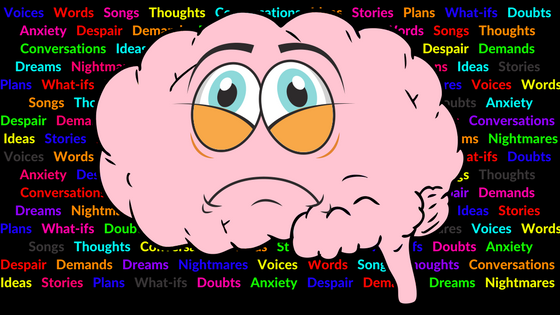 Once expressed, your brain can turn off the endless loop and move on to other things. Try it and see. Your brain is an amazing organ. In it, you have your own private universe. You spend many hours there and may even have conversations with the voices that manifest themselves. It’s a world that sometimes gets too crowded. When that happens, the internal noise from this world can become overwhelming and unbearable for the real world. Journaling is a way to quiet that noise. One great way is through stream-of-consciousness writing. It’s a great tool that many writers use when dealing with writer’s block. The purpose is to get things out and unblocked. Stream-of-consciousness writing isn’t about content but rather the act of writing. Don’t worry about writing complete sentences or even complete thoughts. One writer will pick one word and write it over and over until the page is full or other words start coming. Write every word that comes to your mind. If there is a tsunami of words, write the loudest ones. There is a reason those words are there. Write them down and see where they lead. People sometimes complain about dating those with mental health issues because they don’t let things go. Even after a relationship ends, they keep popping up as new thoughts enter their head, things they wish they had said earlier. If there are words you feel you must say, use the journal. Journaling is a great way to move on from a relationship. You can say the things you wish you had said earlier, you can say the really ugly things that no one should ever say, and/or you can say the things you want to say now but can’t. Journaling is your safe place with no judgment. 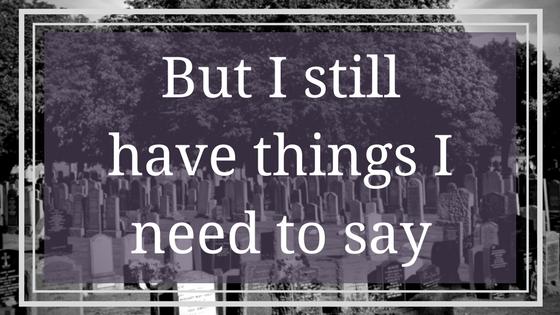 Sometimes the problem is that you have words you need to say to someone that is no longer living. Again, those words are tormenting you because they need to get out. Give them an exit, and they will stop haunting you. There might be some fear of journaling. You might fear that someone will find it and read your most private thoughts. Perhaps you fear that you will read the words later and hate yourself for writing them. There’s no rule that words that are journaled ever have to be read. Feel free to destroy them. Delete the file. 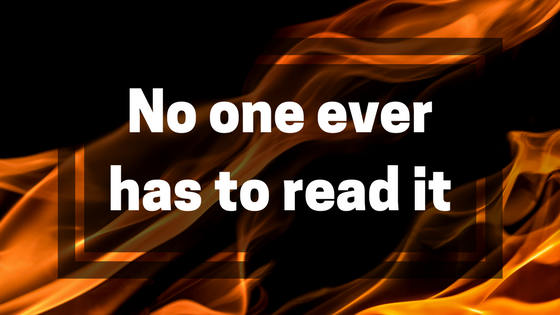 Tear up the page. Toss them into the fireplace. To illustrate, one very dear friend journals by only writing the first letter of each word. She can get all the words out of her head, but later no one, not even her, can go back and see what she said. Remember, the most important thing is to get the words out. Keeping them is entirely optional. In addition to journaling, another way to improve mental health is by being consistent. Read Why Consistency is the Key to Mental Health Success. This is just three ways why journaling is important. 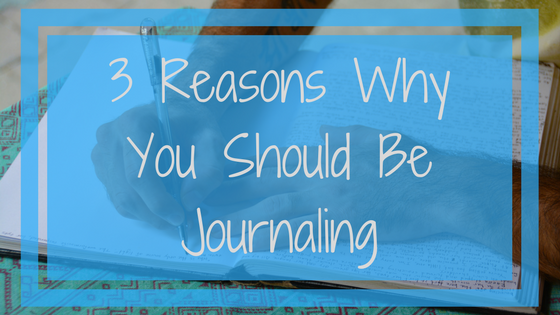 You will likely find many other benefits through your own journaling experience. As you discover these benefits, please come back and share them in the comments below. One of the reasons I began blogging at all was to help me get down my depression before they could smother me. So glad you’re encouraging others to do the same. I’ve kept a journal since 1983 and it’s been my sanity anchor many times. Thanks for your comment and experience.